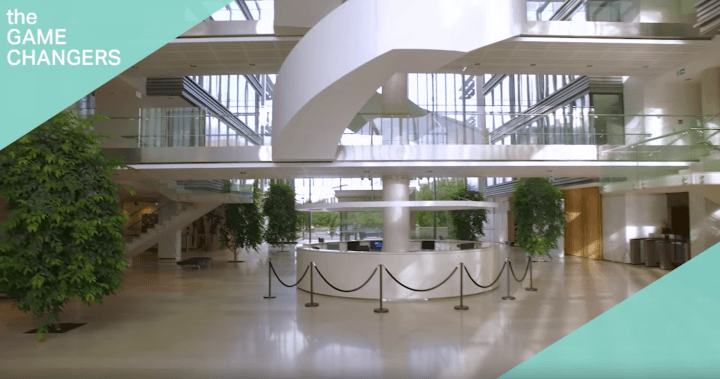 When the Department of Finance released a three-minute ad for their graduate program in late February, it made headlines. Unfortunately they weren’t the kind of headlines many government departments would want. Indeed, when the extreme awkwardness of The Game Changers spread virally around the interwebs, it left some of us wondering if the production company were in fact subversive comic geniuses, hell-bent on bringing down the finance department by revealing how truly mind-numbing it is to work there. The biggest complaint was how wooden the whole thing was. Stilted actors speak unrealistic dialogue in tedious scenarios, and at the end all we’ve learnt is that financial sector employees love walking around empty corridors, holding empty coffee cups and having empty conversations about banana bread. It’s worthwhile asking: could anything have saved this video? By taking a look at the biggest flaws in The Game Changers, we’ve determined some ways in which using animation could be a saving grace in future government ads. We all want to be understood. But when we over-explain things in a creative work, it has this nasty habit of driving away the very audience we’re trying to identify with. Take for example the moment in The Game Changers when a man calls out to his co-worker in a corridor, “Hey buddy! Sorry, I’ve got to do that every time. It’s because we’re in the buddy program.” Gee, thanks Captain Exposition. What a bizarre thing to say to someone who already knows they’re in the buddy program. Then there’s the infamous, “Hey guys! I’m just heading downstairs for my paleo pear and banana bread.” This is the line that got the most flak from the ad. But why? (Besides our knee-jerk reaction to the words ‘paleo’, ‘kale’ and ‘gluten-free’.) Think about how unnaturally specific this line sounds by putting it in the context of your own work life: “Hey guys! I’m just heading to the lunch room for my original recipe pizza Shapes snack pack. Would you like to join me?” “Hey guys! I’m just heading to the vending machine that only sells two types of chocolate bars that went off the market years ago because I left my lunch at home again like a moron. Would you like to join me?” The phrase ‘paleo pear and banana bread’ now becomes starkly obvious as a weird attempt to relate to the audience, falling flat due to complete lack of sincerity. Because it’d be far too unrealistic to simply say, “Hey guys! I’m just heading downstairs for something to eat.” You know, like a normal person. So how can using animation help ease the issue of expository, dumbed-down writing? For a start, the highly visual nature of animation helps us focus on one of the foundations of good storytelling: show, don’t tell. The storyboarding process in particular forces us to consider what visual information we’re getting across in each shot. A picture’s worth a thousand words, as the old saying goes, and demonstrating a concept with a moving image not only creates better recall, but is at far less risk of appearing ‘preachy’. You’re not telling the audience to do something, you’re demonstrating someone who happens to be doing it. I want to start by saying that I am all for use of real, non-actors in documentaries, and sometimes even in fictional films. But in ads? Well… we can see how that turns out in this video. The Game Changers utilised real employees from the financial sector, and real graduates from the program the ad is about. The issue here is that real people have a strange way of feeling insincere on film. When there’s a series of cameras in your face, a boom microphone looming over you and scripted dialogue to learn, it’s hard to feel like your real, natural self. Nothing says ‘cheap’ in a video like poor sound quality: whether it’s uneven volume levels between music and vocals, out-of-sync ADR or, in this case, dialogue that sounds a little fuzzy, a little imbalanced between different actors, and a little ordinary all-round. Let’s not blame the boom operator here: sound recording is hard at the best of times, but especially on a small budget, in an echoing corridor, and with non-professional actors who might not be trained in projecting their voice or annunciating properly. That said, there’s a few ways we can increase our odds of good sound quality through using animation. You’re much less likely to run into sound issues when your actor is set up in a professional recording booth rather than out in the wild. It’s also far easier to ask for retakes when there’s only one actor involved at a time. Mistakes in sound can be easily edited because in the vast majority of cases the audio comes before the animation, meaning sound isn’t yet locked to the visuals. Animation requires all editing to be done up front, so it’s wise to lock down your dialogue in the early stages as there’s no room to ‘fix it in post’.